Craniomandibular variation characterizes the five species of Asian slow loris (Nycticebus), but until now, few ecological studies have been available to understand the factors that underpin it. Here, we review feeding ecology of Asian lorises and African pottos, with emphasis on the importance of exudate feeding, including several new studies. We then present novel data on this behavior based on a 10-week study of N. coucang at Pusat Penyelamatan Satwa, Lampung, Sumatra, Indonesia. Lorises and pottos range in body size from 100 g (Loris tardigradus) to more than 2 kg (N. bengalensis). Three of the smallest species (Arctocebus calabarensis, A. aureus, L. tardigradus) rely mainly on insects and small invertebrates as dietary staples. Although Perodicticus is known to eat gum only from already open wounds, active gouging of bark to extract exudates or consumption of plant sap has now been observed in all other lorises. Five species (P. potto, N. coucang, N. bengalensis, N. javanicus, N. pygmaeus) rely on exudates as a key food source. Although at all field sites, exudates are eaten all year round, at some, they become a key resource in times of food scarcity. Exudates have been extracted from 14 different plant families; Fabaceae is possibly the most important, currently consumed by all exudativorous species. Despite the lack of keeled nails, gouging behavior of lorises closely resembles that of marmosets and fork-marked lemurs, and involves active breaking of the plant surface; the audible nature of this behavior, as well as the characteristic marks left behind, makes it useful for determining the presence of Nycticebus in a forest. The captive lorises in our study also gouged regularly, recorded 2.9 times per hour for both adults and juveniles. Urine and facial marking accompanied the majority of gouges, a behavior recorded before only for marmosets. The functions of this behavior as a resource sharing strategy are explored. The importance of providing opportunity for gouging for captive lorises is also discussed, as a way to mitigate the periodontal diseases, which plague Nycticebus in captivity. We conclude by discussing the importance of a better understanding of this relatively unique behavior to improve our knowledge of morphological correlates to loris taxonomy and ecology, and captive management via dietary changes and enrichment. 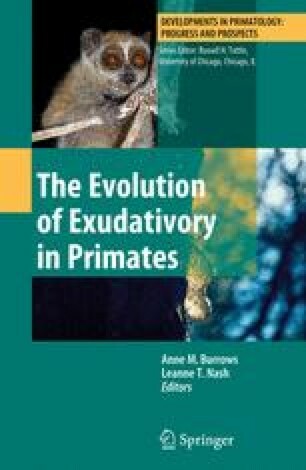 We thank Annie Burrows and Leanne Nash for organizing the symposium at the International Primatology Conference in Edinburgh and for inviting us to participate in this volume. We are extremely grateful to N. Das, M. Pliosoengeon, and I. Winarti for sharing unpublished accounts of loris exudativory; to J. Oates, L. Schein, and E. Pimley for unpublished accounts on the lack of this behavior in pottos and angwantibos; and to A. Rylands and S. Bearder for sharing their observations on exudate feeding in marmosets and galagos. For the Sumatran study, we thank the staff at PPS and IAR, especially to P. Agus, F. den Haas, A. Knight, E. Rahadian, K. Sanchez, and K. Sudaryatmo. International Animal Rescue, International Primate Protection League, Primate Conservation Inc., and Oxford Brookes University provided financial support.